As soon as the bullet pierced Marshall Field Jr.—the only son and heir of Marshall Field, founder of the splendorous department store, the man who famously said, “Give the lady what she wants”— Chicago made the story even bigger than it really was. Amplifying things, good or bad, was what Chicago did best. In the days following November 22, 1905, rumors about the shooting spun through the city's streets. The fruit cart vendors whispered to the newsboys who shouted to the hansom drivers who murmured to the society women who were overheard by servants who gossiped with bartenders who bantered with pimps and whores and drunks. Did they hear the wound was just like the one that killed President McKinley? Tore through his abdomen, caught a corner of the liver, grazed the stomach and skidded to a halt outside the spinal cord—lucky for Marshall Junior. He was in his bedroom at the Prairie Avenue mansion, home alone with his son and the hired help, when a hollow boom split the air. A cry followed, thin and drawn out like taffy. The family nurse and the butler scaled the stairs in flying jumps and found him slumped in a chair, wan face seeking cover in the curve of his shoulder. Goodness, the blood—it was everywhere. Veining across his shirt, fissuring down the wall. His automatic revolver came to rest on the tip of his shoe. He tried to straighten, tread the air as if it were a lolling wave. "I shot myself," Marshall Junior said. "Accidentally." But it couldn't have been an accident. Who really believed that Field dropped his gun, and that the trigger could slam an armchair with sufficient force to explode a cartridge? A reporter at the Chicago Daily News said it was impossible—he took an identical, unloaded revolver, and hurled it several times to the floor. Not once did the thing go off. Marshall Junior must have pointed the gun at himself; it was the only way. And a suicide attempt made sense. He had suffered a nervous breakdown the year prior, in 1904—this act could be a decisive sequel. No, what really happened was sadder than suicide, more pitiful than a nervous breakdown: Field had sneaked off to the Levee district for a tryst at the Everleigh Club. So what if he was married, the father of three—he had money and status and power, and men with those things always went to the Everleigh Club. A prostitute shot him, maybe in the Gold Room or the Japanese Parlor or beneath the glass chandeliers suspended like stalactites from the ceiling. Later, as the sun deserted the sky and the streets gripped the fog, those Scarlet Sisters, Minna and Ada Everleigh, ordered his unconscious body smuggled out and planted in his home. Those Scarlet Sisters heard all about their alleged hand in the incident, how they stood idly by while one of their harlots blasted the poor man, then directed the covert removal of his bloody body. "We are a funeral parlor," Ada Everleigh said, "instead of a resort." Her younger sister, Minna, gave a blunt, trumpet-burst laugh. Ada parsed her words as if they were in limited supply, but damn if she didn't load each one before it left her mouth. The Chicago rumor mill operated as predictably as the Everleighs' regular clients; no matter how gossip began, or where it twisted and turned, it ended up, invariably, at the doorstep of 2131-2133 South Dearborn Street. Nonsense, every bit of it. The sisters had decided long ago to permit no stains, blood or otherwise, on their house. Neither would the Everleighs add their own voices to the din. Discretion paid—but also had its price. Even Chicago's newspapers kept their distance from the speculation for fear that Marshall Field Sr. would pull his advertising dollars. He certainly wouldn't appreciate reports that his son, currently laying in critical condition at Mercy Hospital, had visited a whorehouse, even one as dignified as the Everleigh Club. Still, journalists staked out the sisters all week, trying to score something—anything—that would be safe to print. Minna and Ada waited in the front parlor, expecting yet another newsman. All thirty Everleigh Club harlots remained upstairs in their boudoirs, preparing for the night ahead, running a razor under their arms, down and between their legs—clients didn't have a smooth woman at home. They packed themselves with sponges, made certain they had enough douche, checked cabinets for the little black pills that, along with three days of hot baths, usually "brought a girl around" from any unwanted condition. They yanked and tied each other's corsets, buttoned up gowns made of slippery silk, unrolled black stockings over long legs. Hair was wound tight with pins or left to fall in tousled waves, depending on the preference of their regulars. A dab of gasoline—the newest fad in perfume, if you couldn't afford an automobile—behind the ears, across the wrists and ankles, between the breasts. Eyes rimmed in black and lashes painted, standing stiffer than the prongs of a fork. Each courtesan had a name chosen by her peers. Once she entered this life—the life—she discarded all remnants of the one she'd left behind. Minna navigated the silk couches, the easy chairs and the grand piano, the statues of Greek goddesses peering through exotic palms, the bronze effigies of Cupid and Psyche, the imported rugs that swallowed footsteps. She had an odd walk, a sort of caterpillar bend and hump, pause and catch up, as friend and frequent client, the poet Edgar Lee Masters, described it. She came to rest before a wide-paneled window and swallowed, her throat squeezing behind a brooch of diamonds thick as a clenched fist. Holding back the curtain, she surveyed Dearborn Street. Arc lamps stretched up and out, unfurling bold ribbons of light. The air was thick and yellow, as if the varnish manufacturer on the next block had slathered his product across the sky. Visibility was reduced to the next street, or the next corner, or sometimes just the next step. No matter: Minna didn't have to see the Levee district to know what it was up to. Panders, an underworld term that served as both verb and noun, were outfitted in dandy ties and jaunty hats, lurking in corners and alleys. Eugene Hustion and his wife, Lottie, the "King and Queen of the Cokies," weighed thirty pounds of cocaine and half as much morphine. Soon their salesmen would make the rounds. Funny thing was, Minna knew, Lottie was a college graduate who spoke five languages, and in her spare time composed music and painted portraits. Down the street, at the House of All Nations, johns lined up at the $2 and $5 entrances—too bad the suckers didn't know that the same girls worked both sides. Blind men cranked hurdy gurdies, spinning tangled reams of melody. The air reeked of sweat and blood and swine entrails, drifting up from the Union Stock Yards just a few blocks southwest. Mickey Finn hawked his eponymous "Special" at his Dearborn Street bar. Merry Widdo Kiddo, the famous peep-show girl, warmed up her booth, breasts twirling like pinwheels behind the glass. Levee piano players—"professors," they were called—cracked their knuckles before plucking out the hiccupped notes of ragtime. Minna watched a figure turn the corner of 21st Street onto Dearborn, and waited for the solemn gong of the bell. She patted the dark, frizzed coil of hair at the nape of her neck, and reached for the door. From knuckle to wrist to elbow, waist to bodice to neck, she was ablaze in jewels. Diamonds played with the parlor light, tossing tiny rainbows against the wall. "How is my boy?" she said, her customary greeting for every caller. The boy this time was Frank Carson of the Chicago Inter Ocean, a once-respected newspaper that had declined in recent years. Minna invited him inside with a slow-motion sweep of her arm. He was no stranger to the Everleigh Club; every reporter in the city knew their phone number, Calumet 412, by heart. Carson saw precisely what the Everleighs wished him to see, and knew what they wished him to know. Both sisters had a prim, close-lipped smile, genuine but guarded, as if a full-on grin risked conveying complexities best left unmined. The younger one, Minna, was the talker. She spoke in clipped, staccato sentences, shooting words from her mouth—it was so good to see her boy, it had been far too long since his last visit, he should stop by more often. She broke occasionally for a frenetic drag of a gold-tipped, perfumed cigarette. Ada stood next to her sister, quiet. Her eyes were darker, her hair lighter, her figure fuller. Her hands were wind chill cold. Frank Carson knew they ran a clean place with clean girls; their house doctor never forged the reports. He knew that Sunday was "Beau Night" at the Everleigh Club, when girls were permitted to see their sweethearts, to accept flowers and hold hands, to experience all the thrills of dating as if they lived in homes. He knew there had been a shooting at the Club two years earlier, an unfortunate incident that was no fault of the sisters'. He knew the Everleighs brought a bit of decency to a profession rife with shame. He knew Prince Henry of Prussia had visited the Club three years earlier and sipped champagne from a courtesan's shoe. He knew they had the ear and the respect of the most powerful men not only in the Levee district, but the entire city: Big Jim Colosimo, Ike Bloom, Bathhouse John and Hinky Dink Kenna. He'd heard they'd come up from Virginia or Kentucky, or a farm someplace in Indiana—Minna insisted that their Southern accents were part of an act. They'd been married, the story went, to vicious, violent men. 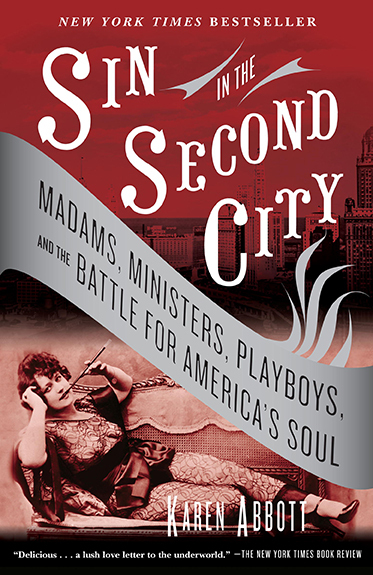 He knew a fellow Chicago journalist, Jack Lait, declared the sisters were "to pleasure what Christ was to Christianity." What the reporter didn't know was how avidly the sisters, generally speaking, disliked his gender. Minna took charge, ordering her boy to please sit and make himself comfortable. Yes—on that silk divan. She and Ada settled across from him. Edmund, the butler, appeared with a flute of champagne, which Carson downed in one zealous gulp. Minna signaled to keep the bubbly coming. Carson asked what they knew he would ask. If Marshall Field Jr. had indeed ventured into the Levee on the night before he was shot, where else would a man of his stature go but to the Everleigh Club? Minna and Ada smiled but said nothing. Had Field, as one nurse alleged, been pierced by a paper knife and not a bullet? The sisters replied that they had no idea. If the Everleighs really had no involvement in or knowledge of the tragedy, why not dispel the rumors and just say so? Edmund arrived on cue, offered their guest another drink. Carson, like all the others, left with a giddy champagne buzz but no story. But Marshall Field Jr. wasn't dead yet, not in any sense of the word. Chicago was changing. Every day it awoke a new city. Its leading citizens no longer recognized it as the place that had raised them. The stream of immigration that flowed in the 1890s became a deluge during the first decade of the new century. More arrived every day from Italy and Germany, France and China, Russia and Greece, bringing with them their odd customs and habits, their peculiar religions and strange tongues. They joined the thousands that had descended during the 1893 World's Fair, disreputable men and women who stayed long after the Ferris Wheel was dismantled and Buffalo Bill skipped town. Together these interlopers built their own cities within the city, block after block of gambling parlors and opium dens and brothels where inmates dangled bare breasts from windows and did unspeakable things with animals. What depravity went on inside a dive named the Bucket of Blood? Did a street called Bed Bug Row belong in a town like Chicago? The horrors were spreading to respectable neighborhoods and solid homes. Young women were no longer content to sit with suitors on front porches or in parlors. Ten months earlier, in January 1905, a teenage girl from a good family guzzled a mug of chloroform and died on the floor of 33rd Street's American Dance Hall. There were whispers about syndicates of evil men, foreign men, who lured girls to the city, drugged and raped them at "clearing houses," and sold them for fifty dollars to enterprising madams. Advertisements in newspapers seeking secretaries and clerks and leads for musical productions were best read skeptically. The taxi driver could deliver a girl straight to evil's door. The nickel theaters were moral suicide. Not even the ice cream parlors were safe. If things continued as they were, the Levee district would corner Chicago and swallow it whole, this fine, proud city that wielded its triumphs like a scepter and wore its reputation like a crown. Surely the rest of America would not be far behind. The Marshall Field Jr. shooting was a seismic boom with aftershocks that rattled the Everleigh Club. The sisters would be hit from both sides, the law and the outlaws, two diametrically opposed groups who disdained them for precisely the same reason. The Club was the gleaming symbol of the Levee district, shining too brightly on those who operated best in the dark. "They were the Angels of the Line," wrote journalist Charles Washburn, twenty-five years after the war over the Levee, "and, as angels, hated and persecuted." But on that fall night, as Minna Everleigh watched the reporter disappear into the murk of Dearborn Street, she did not fret about what trouble might come, or who would be behind it. She and Ada had work to do: keep books, prepare the courtesans and greet their boys, watching each man admire the seesaw sway of a girl's rear as he followed her up the stairs. Would he like a warm bath, or something scrumptious from the Pullman Buffet, or a favor far too naughty to say aloud? They ran the most successful—and respected—whorehouse in America, and had no reason, yet, to believe that would ever change.